Confused? How to extend or reset the trial period of any software? Yes! Then, you at the right place. All the software can be divided into three categories. The first category caries software that are completely free to download and use. The second category includes software that are paid. Either you have to send some money to buy them or some functions are locked. So, you have to pay to the developer to get premium content unlocked. And, the third category is of software that are of trial period. This third category of software includes application software that are available on trial period. In that trial period you get access to all the premium content and settings, options of the software. Once the trial period is over, you have to pay some cash and get the whole software. Let’s take a recent example, YouTube has now featured three months add free period for free. You may also like to download snapchat++ apk for windows. You will not see any advertisements on any YouTube video. After three months, you can buy this premium service. However, if some kind of software is fulfilling our needs in trial period and the premium version of that software is a big expensive then why opt to buy the premium version if trial period is doing work done expertly. Thus, below we have featured the best 3 methods that you can follow to extend or reset trial period of any application software. The first method is by deleting registry which is the best method to follow this time. So let’s start..
1. First of all, if you have installed any other software to extend the trial period then you have to uninstall it first. 2. Now, click on the window icon and search for RUN. 4. Now, hit the enter button. 5. In this window, find an option called HKEY_LOCAL_MACHINE SOFTWARE and click on it. 6. Now, click on the software which you want to extend the trial period. 7. Here, look for an option called HKEY_CURRENT_USER Software then click on it. 8. Again, delete the name of the software which you want to extend the trial period. 9. Once done, close the registry window. 11. Now, hit the enter button. 12. A new window will pop-up with the list of temporary files. Just delete all of them. Ignore those who are not deleting. 13. Now, head to desktop screen. 14. Open computer then click on C Drive. 15. Now, open folder Appdata. 16. In Appdata, three folders can be found namely Locallow, Roaming and Local. 17. Open and check then delete all instances of the related software if found. 18. Now, restart your PC once then install the application once again. 19. Voila! You have extended the trial period of the application. 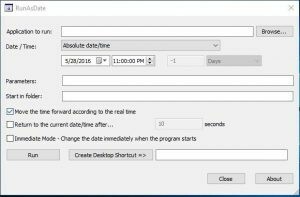 RunAsDate is the best application you can install on your Windows PC to extend or reset the trial period of an application. This software works vert well and make the work done. 1. First of all, Download the RunAsDate application on your PC. 2. Once downloaded, install it as well. 3. Now, use the homepage of the RunAsDate and browse the application whose trial period you want to extend. 4. Once the software is selected, select the date and time. 6. Here, a desktop icon of the application will be created. You only need to open the application through the desktop icon of the application. 7. Voila! You have successfully extended the trial period of an application. 1. First of all, Download the Time Stopper Software in your PC. 2. 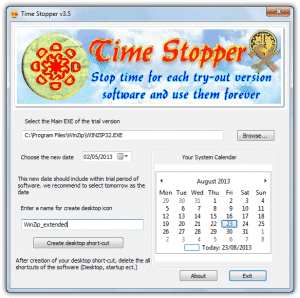 Once, you have successfully downloaded the Time Stopper Software then install it. 3. After installation successful, open Time Stopper Software and browse the .exe application software you are looking to extend the trial period. 4. Now, you have to select a particular date and time. You can select as per your wish. 5. Here, a desktop icon of that particular application software is created on the desktop screen. 6. Voila! You have successfully extended the trial period of the application software. Note: Now, always use the desktop icon to use the particular application software. Deleting this desktop icon will end the trial period which is being created. Here we have provided the best methods to extend or reset trial period of any software. We hope this article helped you. Don’t forget to comment below guys if you face any problem while extending or resetting trial period of any software with any of the above featured methods. Have a nice day. TechVictoria! !